A rainy gray afternoon in November. Minneapolis, Minnesota. 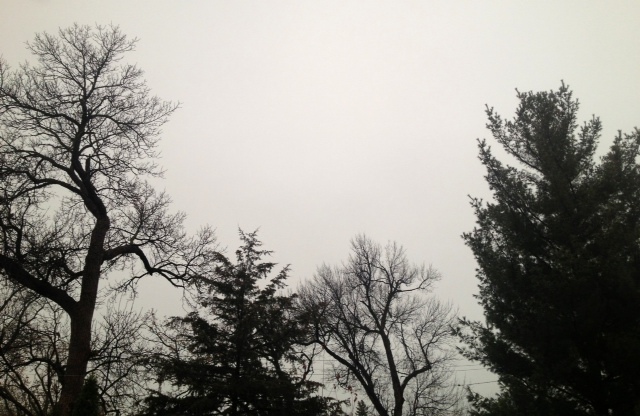 November in Minnesota is typically the grayest, gloomiest month of all. All the sensational fall color has gone leaving only a barren, lifeless brown landscape and gray skies. It is quite a contrast from September and October which are two of my most favorite months here. It is almost that fall is so incredibly beautiful as to prepare us mentally for November and the onset of a long, cold white winter. It doesn’t help either that the sun sets so early and rises so late. The days are short and dark. But thankfully once December rolls around and we get that first snow, the landscape becomes a magical, beautiful winter wonderland with brilliant sparkling white and azure blue skies. It may be cold but at least there is lots of sun. For me, the best way to deal with sunless days is to get outside and run. Outdoor activity even without sun or in the rain helps my body and soul immensely. It also helps to light lots of candles and have a fire going. Anything to brighten up the house greatly enhances my spirit. One thing for sure is that I could never live somewhere where it is rainy and gray for months on end. I can take the cold as long as there is sunshine. Here’s to a few more weeks of grayness and the start of winter. Not long now and we’ll be getting that first bright coat of white, fluffy snow. I can hardly wait to put on my snowshoes and explore the beauty. Yes….waiting for the snow and sun. Now just clouds and gray. This entry was posted on November 17, 2013 by thirdeyemom in RANDOM THOUGHTS and tagged feelings, gray, NaBloPoMo, seasons, weather.